Heredis 2019 offers you the opportunity to quickly create your family tree from your Mac. 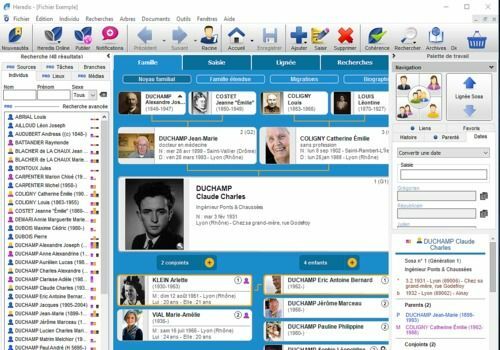 To do this, the software provides you with a wide range of tools to search for an ancestor, describe his professional and emotional background, but also determine his affiliation links with other members of your family. Fully customizable, it gives you the possibility to add the photo of your ancestors, but also a copy of their marriage certificate. Well thought out, Heredis version 2019 also works for stepfamilies, via its new feature called "Extended Family". Heredis 2019 for Mac features an intuitive, easy-to-use interface that offers four different perspectives of your family. In addition, it includes the extremely practical "Migrations" tool to trace the geographical journey of your family members over the centuries and more simply identify your origins. Also note the Heredis 2019 Research Assistant, which allows you to see at a glance the missing elements in your family tree. The latter will also give you tips on how to get them back as soon as possible. Finally, regarding the publication of your data you can rely on the Heredis Online module. MacFamilyTree is the perfect tool to design a family tree and discover the history of a family. This application integrates a multitude of features to make the task easier. For example, we can talk about the FamilySearch module, the largest genealogical database made available to the user. Another example is the virtual tree, a three-dimensional image displaying important data for each family member. Build a simple but complete family tree by downloading the free Gramps free software. Available on Mac, it provides users with tools to create individual records, view their tree from different angles, and locate different locations.